Risk analytics makes organizations aware of the potential risks in their businesses. It helps companies make risk-aware decisions and improves their overall business performance. Risk analytics tools help investors get a better return on their capital and minimize the money required to be spent on regulatory compliances. Risk analytics tools aid in the central clearing of over-the-counter (OTC) derivatives. Type of solution: Risk analytics software group for regulatory compliance, market risk management, credit risk management, etc. are included in this group. Services: Software services associated with risk analytics software like systems integration and risk evaluation are included in this group. Risk analytics is expected to draw large revenues from BFSI sector. Recent times have seen developing countries perform better than the developed economies. This causes currency fluctuations and entails considerable risk. In the face of this current economic climate, BSFI sector is demanding improved risk analytics solution. State-of-art risk analytics tools are an absolute necessity for BSFI sector as they have to spot potential frauds using statistical models. Small and medium sized enterprises lack cognizance of risk analytics tools. Moreover, a hefty amount of money is required for the installation of risk analytics tools. 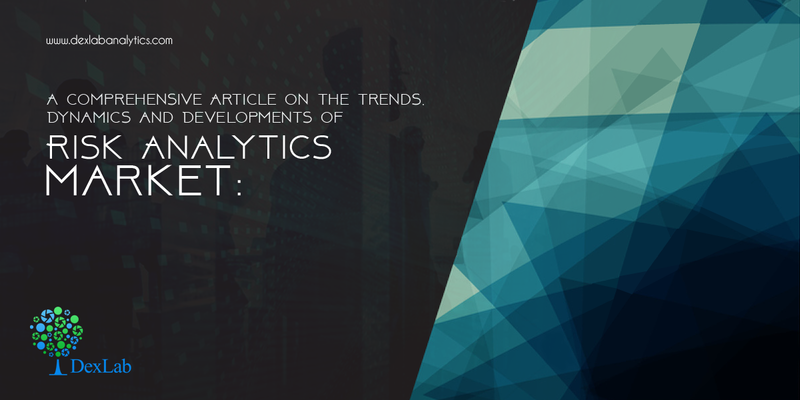 These issues are likely to hinder the growth of risk analytics market. A developed IT sector and authoritative presence of blue chip companies are the key factors boosting the development of risk analytics market. North America is expected to hold majority of the market share in risk analytics market. Significant growth in risk analytics market is likely to occur in the Asia Pacific region. The growing competition in the market and fluctuations in currency will fuel the demand of risk analytic tools. With the rise in global risk, companies have to adopt new approaches to analyze risk. Big data and artificial intelligence are paving the way for the development of revolutionary strategies. CEOs are seeking the valuable input of insurers to curb the threat of cybercrime. Risk teams are turning into strategic advisors. To know more about risk analytics follow Dexlab Analytics- a premium analytics training institute in Delhi. To gain proficiency in credit management tool, enroll for their credit risk modeling courses.